Completely autonomous time tracking system and logbook in one - helps you to stay on track. With Qlaqs Route you don´t need to take care of anything. The app tracks your daily routine through elaborated algorithms and it synchronizes your data automatically into the Qlaqs Cloud. Route is the companion for your everyday life. The app runs in the background and handles everything by itself. Once started, the app tracks all your ways and stays. Route tracks via GPS your ways and your stays. At the end of the day you will have a detailed logbook including stopovers - where, when and how long. Provide once your Qlaqs log in information and your data will be synchronized automatically - no manual transfer anymore! If you have recurrent sites in your daily routine the app will recognize them automatically. To every site a project or task can be assigned. Times you spend there will be booked directly on the correct project and task. 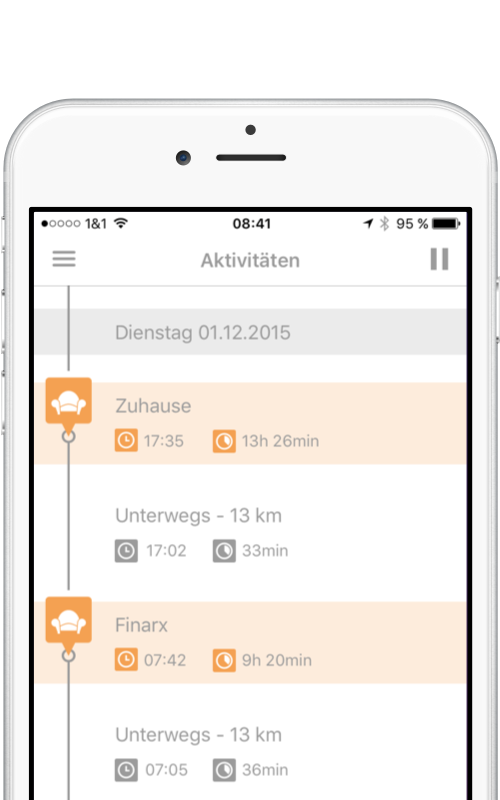 Autonomous tracking of your stays and ways through elaborated algorithms. Learn all details about backdated stays and ways (times, duration, distance). Through the integrated map view you can track your ways graphically. Let sites be recognized autonomously and let your time be tracked automatically. Connect your Qlaqs account with route and book working times out of presences directly on the assigned project or task. With Qlaqs synchronization your times are available everytime and everywhere. Use the Qlaqs WebCenter to evaluate your data.